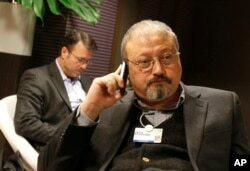 FILE - This image taken from CCTV video obtained by the Turkish newspaper Hurriyet and made available on Oct. 9, 2018 claims to show Saudi journalist Jamal Khashoggi entering the Saudi consulate in Istanbul, Oct. 2, 2018. 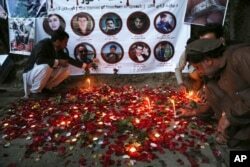 FILE - Afghan residents light candles to pay tribute to Afghan journalists killed in a suicide attack in Kabul, Afghanistan, May 3, 2018. FILE - A portrait of slain television reporter Viktoria Marinova is placed on the Liberty Monument next to flowers and candles during a vigil in Ruse, Bulgaria, Oct. 9, 2018. 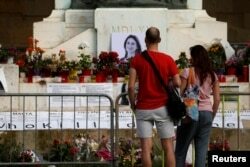 FILE - People look at the makeshift memorial to assassinated anti-corruption journalist Daphne Caruana Galizia on the Great Siege Monument after the police blocked off access to it, in Valletta, Malta, April 22, 2018. Caruana Galizia had been a thorn in the side of the powers that be on the Mediterranean island for years thanks to her probes into government corruption and nepotism and into the links between Malta's online gambling industry and organized crime. FILE - Slovakian President Andrej Kiska arrives at the press conference at Presidential Palace in Bratislava, March, 20, 2018.